I figured before I totally dive into all things holidays, although let's face it I already have, I figured a little goal housekeeping is in order. Let's see how I did in November. 1 lb down but I haven't been totally clean eating or working out my five days a week consistently due to wanting to get all healed so I'm okay with that. + Hello and welcome Christmas. Start the decorating! Still a bit to do but I'm cutting myself a bit of slack. + Family pictures and cards need to get scheduled and done. + Start family shopping for our trip to TNT. + Enjoy a mini getaway with two lovely ladies. So not too bad for a partially sick, pretty busy November. If my mud room could clean itself, I'd be so happy! Now onto December..... no goals just a big old bucket list chockful of fun! Our main thing is to enjoy the spirit of the season! Lots of family time, moments and memories just soaking in this beautiful, festive time. What's on your bucket list this Christmas? I have always wanted to have a signature cocktail for the holidays and you just reminded me..gonna get on this one. It sounds like you had such a productive November! You're inspiring me to get on my December list!! Love this!! 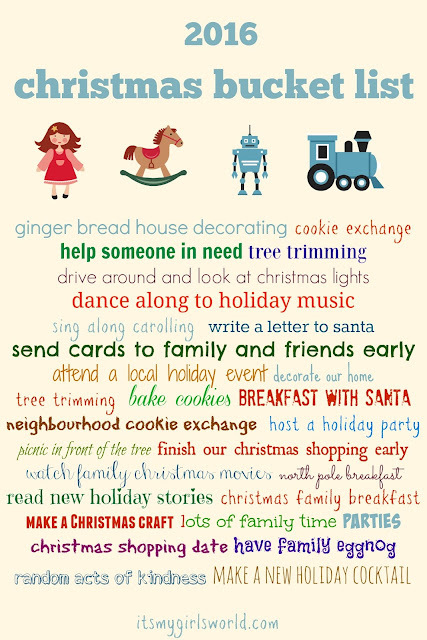 I have to make a Christmas bucket list! I've hosted Christmas Eve for two years and had a signature cocktail each time! It was fun! Have to think up one for this year, even though I am not hosting! Love, love, love your bucket list. I really scaled back my goals this month so we could work on ours too. That is a great bucket list!